Two things I love about reading. One is library books. I love them because they are free, so if you get a book that is a total waste of paper, at least you didn’t waste any money. I’ve been fortunate in that every place I have lived there has been a library accessible to me. Even in Buffalo although I abused the privilege and kept the book for a year, and when they sent me the overdue book letter with notice of a fine that was more then the book was worth, I just dropped it in the book return. I can probably never get a library card in Buffalo again. In the Hudson Valley, not only was I within driving distance of 4 libraries. I could request a book from any library in the Hudson Valley Library system. The other thing I love is my e-reader. It is so convenient to have all my books in one little device I can carry about with me. So imagine my joy when I discovered you could borrow e-books from the NYPL. Yes I was jumping up and down, well I would have been if I had wanted to actually get off my couch. Which I don’t have to do now to get my books from the library. There is one little problem. The last time I borrowed a book for my e-reader, the quality was not good and I could barely read it. However, Kindle books are available and I have a Kindle app on my iPhone. I went in on NYPL mobile site and requested the book. Not downloadable through their mobile site. I had to go online with my computer and download the book. I wasn’t sure how this would work, but when I clicked to download the book I was redirected to Amazon and the book was sent to my phone. I would be able to read it the next time I synced my Kindle app. Except it didn’t. I synced and no book. However, when I went to Amazon on my phone, the book was available for download in my ‘digital purchases’, so I was able to get it on my phone and read it. Also, with the Amazon cloud reader I am able to read Kindle books on my computer. How cool is that? I know, I don’t really like reading books on my computer, but the print is so big and at this stage of my life, the bigger print the better. This morning I woke up late. It is my Wednesday off and I was looking out the window wondering if I should get up or not, thinking about what I had planned for the day, when it hit me. I didn’t blog yesterday. So here it is January and I have already missed a day. Yesterday I got an e-mail that a book I requested from the library was in. I didn’t even remember that I had requested it. So I picked it up and when I got home I read it. That is what I was doing instead of blogging. I have discovered that while reading may give you great ideas and inspire one to write, it is impossible, for me at least, to do both at the same time. So last night I read and didn’t blog. Today I have sort of made up for it. Not just in writing this blog post, but I wrote three (3) reviews on my other blog. I am kind of proud of myself for buckling down and doing them before I finish another book. Now I just have to decide, what book should I read next? Today is the 100th anniversary of the Triangle Shirtwaist Company factory fire, a tragedy in Lower Manhattan that claimed the lives of 146 people, all but 23 of whom were young women. One of the landmark disasters in American history, it eventually inspired important shifts in the nation’s laws, particularly those protecting the rights of workers and the safety of buildings. The Triangle shirtwaist factory fire, as it is commonly recorded in history books, was one of the nation’s landmark disasters, a tragedy that enveloped the city in grief and remorse but eventually inspired important shifts in the nation’s laws, particularly those protecting the rights of workers and the safety of buildings. The tragedy galvanized Americans, who were shaken by the stories of Jewish and Italian strivers who had been toiling long hours inside an overcrowded factory only to find themselves trapped in a firestorm inside a building’s top floors where exit doors may have been locked. At least 50 workers concluded that the better option was simply to jump. For more information: The New York Times. Nothing you would really notice though, I just made a few little changes to my widgets. I now can see how many posts I have made in a month and I am only 3 post behind for February. That is one of the reasons I decided to pop on here and make another entry. Now comes the really tough part of the year, when I’m trying to blog here and blog on my Yankee blog. I also need to keep up with my book review blog. Its going to take some juggling and some discipline, and less time on twitter I think. I also think I can do it. >With all the running around Saturday I forgot to go to the library. Sunday I had to catch the train before it opened. Today someone from the library called me. It was in response to an e-mail I sent about being on the waiting list for a book I requested. Apparently since Beacon owns the book, and I am picking the book up in Beacon, that puts me on a ‘preferred list’. I’m second on that list, I will probably still have to wait a few weeks for the book, but I have all the other books I requested, which I forgot to get on Saturday. During the course of the conversation she mentioned my books needed to be picked up today or they would be sent back. “GULP” There was no way I could get there before they closed. Even though I felt horrible today and wanted to come home early, I wasn’t sure I could get anyone to come get me or take me to the library afterwards. She did me a ‘favor’ (I think) by checking them out for me and I will just be able to pick them up tomorrow. I have a couple of theories why, one being I don’t know how much work it is for them to take the books off the shelf and send them back or two, of all the books I have requested, this is the first time I haven’t been it to get them. Anyway, hopefully I will able to get my books tomorrow. >Someone recommended this book to me. I am not recommending this book, I have not read it yet. This is the summary of the book. To five-year-old Jack Room is the entire world. It is where he was born and grew up; it’s where he lives with his Ma as they learn and read and eat and sleep and play. At night his Ma shuts him safely in the wardrobe where he is meant to be asleep when Old Nick visits. Room is home to Jack but to Ma it is the prison where Old Nick has held her captive for seven years. Through determination ingenuity and fierce motherly love Ma has created a life for Jack. But she knows it’s not enough…not for her or for him. She devises a bold escape plan one that relies on her young son’s bravery and a lot of luck. What she does not realize is just how unprepared she is for the plan to actually work. 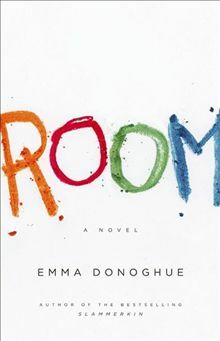 Told entirely in the language of the energetic pragmatic five-year-old Jack ROOM is a celebration of resilience and the limitless bond between parent and child a brilliantly executed novel about what it means to journey from one world to another. I have read another book by Emma Donoghue called Slammerkin. There were some other books I wanted to read so I went online and requested them from the library. I got e-mails about the other books but not this one so I checked on it. Apparently, I was not the only one that got a recommendation about this book. There were something like 76 requests, but only 34 books. I got the bright idea that maybe the NYPL (New York Public Library) would have it. So I went online there and put in a request, there were 93 requests but more books. So I requested it. I was told I couldn’t put a hold on the book, there was ‘something wrong’ with my card. My card expired on 1/1/2011 and I had to renew it in person at the library. Oh crap. Now when was I going to be able to do that? As it turned out, Wednesday morning my alarm didn’t go off. Stitch told me he wasn’t sure if this was the Wednesday I worked or was off so he didn’t wake me. I got ready and he took me to the train station, but I told my boss I would be in at noon and used the extra time to go to the library. After I renewed my card, I went on the computer and put a hold on the book. I stopped to chat with two very nice ladies that work/volunteer at the library and told them what I had done. One of them said, “You know they’ll both come in at the same time.” Then there was a flash and they started to look around, “Someone is using a flash.” Flash photography is not permitted in the library. So I asked them if they want me to go hit the person with my cane. To which one replied, “YES! VERY HARD!” Nice to know I’m not the only mean old lady. >My regular Wednesday off. I had planned to do a lot, and I did, just not exactly what I had planned. I got my taxes done, I got my reimbursement request sent, I bought tickets from Stubhub. I went through my books and sent a list to trade. I like my books and I really don’t want to part with them. However, sending them to someone who also likes to read doesn’t feel bad. The things I wanted to do but didn’t were going to exercise and do laundry. The laundry didn’t get done because the washing machine was occupied, exercise was just, I got there and didn’t feel like going in. I can’t go tomorrow because for some reason I have to take Tigger to the Verizon store which I really don’t want to do, I want to go exercise and take a nice shower. I don’t see how I can do both. It always takes so long at the Verizon store. For some reason I am the only one who can take him. I want to post about the concert but I need to scan the tickets so you can understand what happened and when I was connected to my scanner I forgot all about them. It seems kind of lame to end a post like this, but I don’t really have much else to say. >Those of you who have been around for a while know I have more then just this blog. Last night I was on my book blog Bella is reading … posting my latest review. I don’t go on that blog every day, just to post reviews and other book related news. My reading is way down this year. Imagine my surprise when I looked at my followers and saw that I have 50 followers on that blog! Came back here to see I have 31! Wow! People are reading my blogs! I better shape up and watch my mouth! Back to my life, I have been taking it pretty easy these past few days. Getting up when I want, doing pretty much whatever I feel like. Tomorrow it ends, back to work for a couple days, then off again. This week coming up is a three day work week. Nice huh? >but I just wanted to post some more. Problem is, I can’t remember what I had to say. I need to type my review of Dancing with Ana, so I can then post my review of The White Queen, tomorrow the contest ends. So if you haven’t entered, get over there and enter! After work Nick and I went to Kohl’s (yes I know I was supposed to go to Allsport, I was too tired) and I got another pair of shorts. I also tried on this really cute skirt. It fit but it was too short. Tomorrow is the Loggins & Messina concert. I am not going, Em and Gwen are going and maybe D. Gwen wants me to use her real name in here but I am so used to Gwen, and besides you already know her as Gwen and that would just confuse everything. I am now caught up with the number of posts for this month, I just have to post twice a day until the end of the month. With nothing going on, expect short posts.